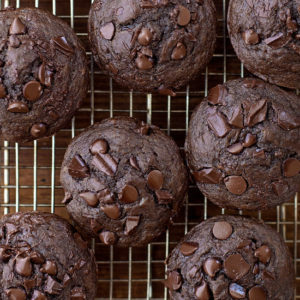 Triple chocolate banana muffins- a sweet and indulgent breakfast treat. 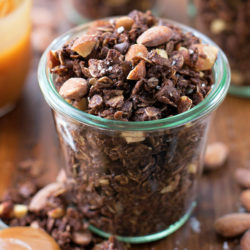 Moist and tender with hints of coconut, banana, and of course, chocolate! About two months ago I posted this recipe on Instagram stories. 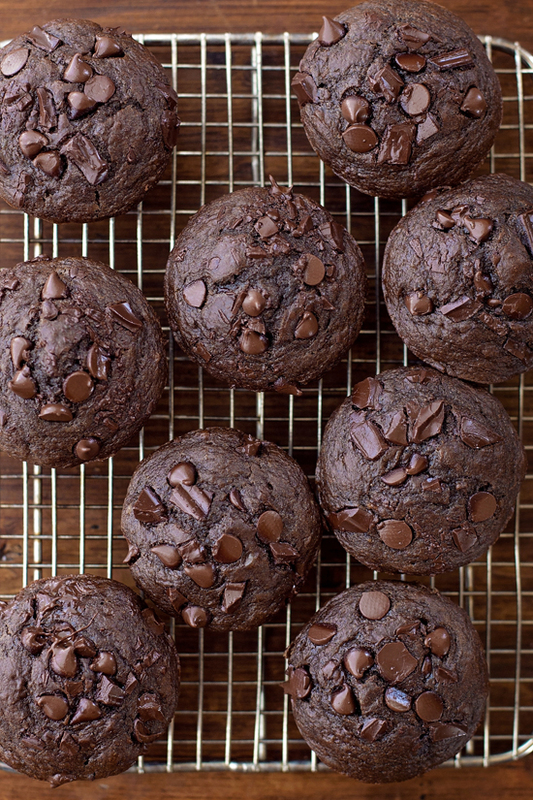 It’s a slightly healthier version of my double chocolate muffins. My kids loved them and so did our baby sitter. 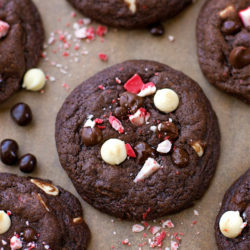 They’ve got a subtle hint of coconut flavor from the coconut oil, lots of banana flavor and even more chocolate flavor!! I used Greek yogurt in place of sour cream and swapped out some of the all-purpose flour for white whole wheat. They’re tender and moist without being rubbery, and plenty sweet thanks to the brown sugar and overly ripe bananas. I wasn’t able to snap very many pictures because they had just come out of the oven right as we were running out the door. Just know that they got two thumbs up from everyone who tried them, myself included. They’re perfect for breakfast, a mid afternoon snack or a post-workout treat. Grab a glass of milk, because you’ll definitely need it! Preheat oven to 400 degrees. Line a standard size muffin tin with liners; set aside. In a large mixing bowl or the bowl of a stand mixer, combine the sugar and oil. Beat on high for 2 minutes. Combine the cocoa and the hot water in a small bowl, whisk until a smooth paste forms. Add to the sugar and oil, beat for 1 minute. Add the eggs and vanilla, mix until combined. In a separate mixing bowl, whisk together the flours, baking powder, baking soda and salt. Gradually alternate adding the dry ingredients and the yogurt and banana to the large mixing bowl. DO NOT OVER-MIX. Fold in ¾ c. of the chocolate with a spatula. Using a large scoop, fill each liner (I use a #20 scoop which as approximately 3.5 tbsp.). 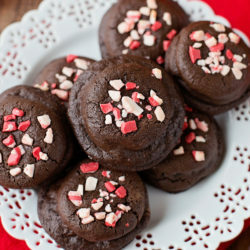 Sprinkle the remaining ¼ cup of chocolate on top and gently press into the batter. Place in the oven to bake for 7 minutes at 400 degrees, then reduce the heat to 350 degrees and continue baking for 8-10 more minutes. The cracks should look slightly moist and the edges should be firm. Remove from oven and allow to cool in the pan for 5 minutes before transferring to a wire rack to cool completely. *I used Guittard Cocoa Rouge. Feel free to use any high quality cocoa powder. 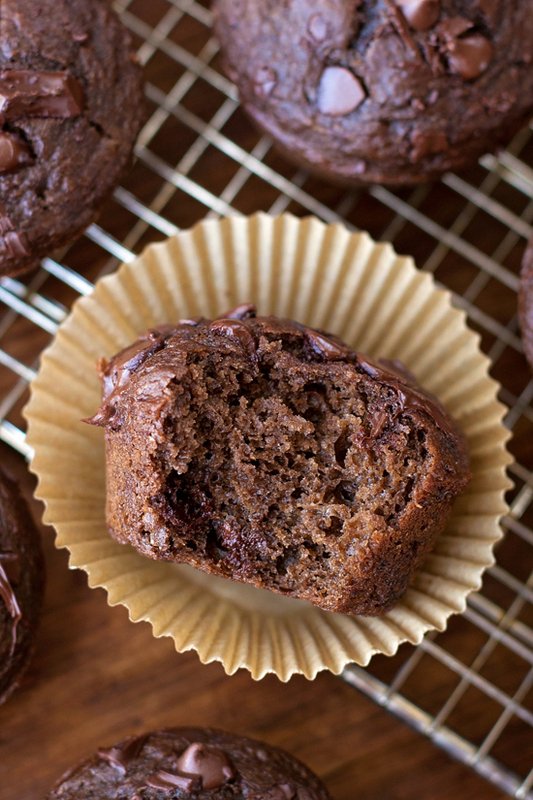 -Try adding a swirl of Nutella or chopped nuts to these muffins!